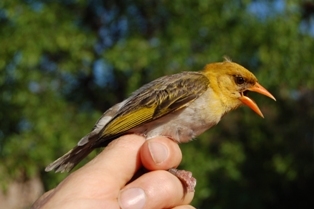 A team of 4 ringers and 2 trainees went on a ringing trip to the Limpopo River; for me to target especially Red-headed Weavers but also more White-winged Widows and Lesser Masked Weavers. 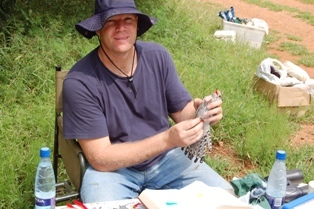 Dieter met Derek Engelbrecht at a field at the Polokwane Ultra-Shell to catch White-winged Widows on 2 Feb afternoon. A flock of females and my first breeding male were caught. 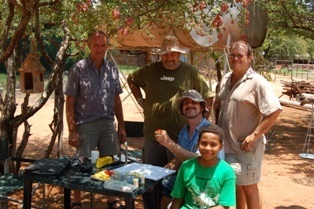 That afternoon 6 people met at Platjan Lodge on the Limpopo River(me, Dirk van Stuyvenberg, Peter & Dominic D'Arcy, David Pretorius, and Louis), with David and Louis already catching birds by the time the others arrived. 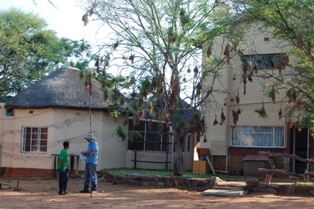 This was our accommodation for 2 nights while ringing in the area. 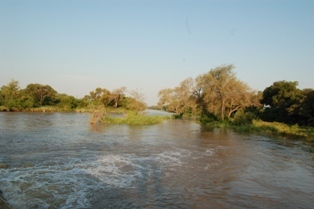 The Limpopo was full due to much rain in northern South Africa over the past month or two. Red-headed Weaver female The farm south of Platjan had active Red-headed Weaver colonies around the farm house. 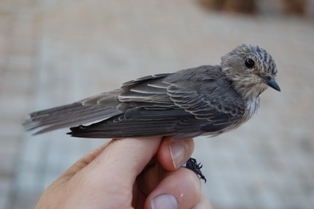 Dirk and I ringed here for the entire morning as we had not handled this species previously, while the others ringed along the river. 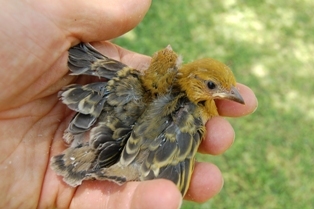 Diederik Cuckoo chick Several Red-headed Weaver nests were low enough to reach. 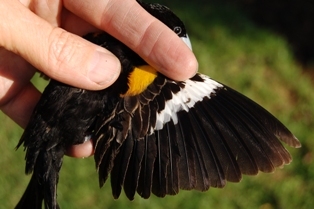 No eggs were found and several nests had chicks which could be ringed. 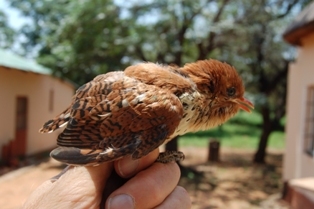 One nest even had a Diederik Cuckoo chick. 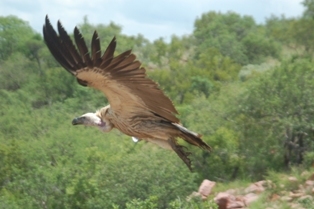 Cape Vulture taking to the wing In the afternoon we were going to ring at Magalasinkwe Safaris but it was too windy. 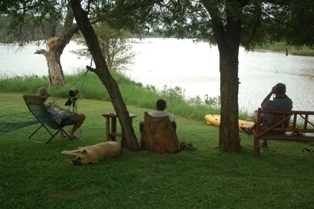 Instead we relaxed next to the Magalakwena river which runs into the Limpopo. 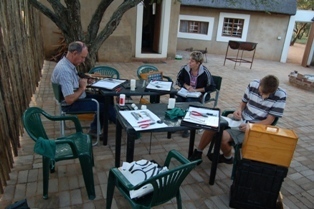 On 5 Feb Dirk and I returned to Pretoria via Blouberg Nature Reserve. We were surprised to discover Johan Botha with a film crew to film the release of 4 Cape Vultures. It was amazing to watch 3 vultures take off. One vulture did not fly off, however, and we took it to Kerri Wolter at the Rhino & Lion Wildlife Conservation Centre in Skeerpoort. 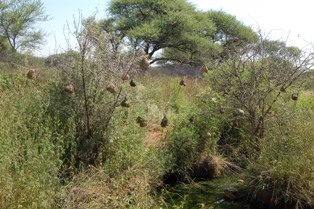 Southern Masked Weaver colony, where most birds were caught in the morning On 6 Feb Dirk's family (Karen and Stefan) and I ringed at Wolfhuiskraal. A variety of birds and 4 weaver species (White-browed Sparrow-weaver, Southern Masked Weaver, Red-billed Quelea and White-winged Widow) were captured. 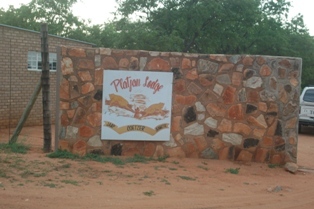 All these sites have accommodation & potential for ringing sites for any ringers wanting to ring in the Limpopo area - note there is no cell phone reception along this stretch of the Limpopo. 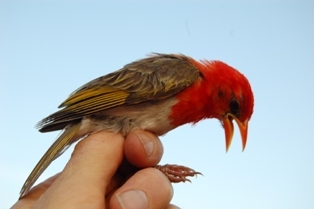 Thanks to Lance Peppler for a reason for this trip, and to Joseph Heymans for info on the Red-headed Weavers.